This is a project my fifth grade students are currently finishing, but I couldn't wait to post about it! It actually began as a still life project, but soon transformed into so much more than that. I have been trying to give the students more control over their artwork- a chance to show more creativity, when possible, and this project seemed to lend itself perfectly to that. This haunted house was a favorite and was used over and over again. Then, the students were instructed to choose a place around the still life and begin drawing, using pencil. They were given 12" X 18" watercolor paper and a drawing board. The only stipulation was that they had to draw items that were in front of them. They could change the scale, position, and even deconstruct the items to create their compositions. The drawings they came up with were very interesting and creative! They found the stars on the fabric and used them in the sky, the fence around the haunted house was used as a backdrop in some artwork, and jack-o-lanterns of all shapes and sizes smiled from many papers. In the next step, the students traced their drawings with black permanent marker. This one isn't painted yet. It took her a very long time to draw and outline! Next, I introduced painting with watercolor, which is my absolute favorite medium. I encouraged them to explore mixing color, while reminding them of the color wheel and what happens when mixing complements (baby poo is what they call it!) 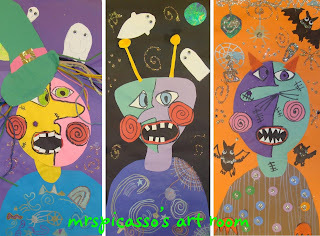 I believed (and rightly so) that no matter the results, they would be beautiful since these were spooky Halloween paintings. We used liquid watercolors for this project. So much easier, quicker, and less expensive! I was particularly drawn to this painting. I love how she made the pumpkin so large and used the round sign from the still life as the welcome sign for the haunted house. AND, she painted is bOOifully. BONUS!!! 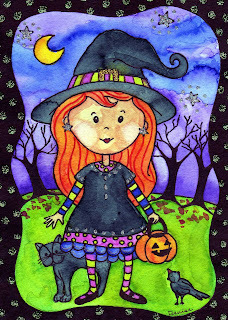 And just to show you how much I LOVE watercolor & Halloween, here is one of my paintings, entitled "Little Aleigha Witchy-Poo." Enjoy!! These are terrific! I really like the bold lines with watercolor.. And you have clearly taught them about composition. You could put them together and illustrate a children's story. And your little witch is adorable! Those are gorgeous! Great lesson plan! Fabulous. Absolutely fabulous!! I love your still life setup, and your approach. I think we're on the same page. I love these. By the time Halloween season comes around, my class will have learned all about the colour wheel...this is great!! Can I ask how you assessed this lesson? Notecards & A Little P.R.